Nitric oxide (NO•) plays a pivotal role as a leishmanicidal agent in mouse macrophages. NO• resistant Escherichia coli and Mycobacterium tuberculosis have been associated with a severe outcome of these diseases. In this study we evaluated the in vitro toxicity of nitric oxide for the promastigote stages of Leishmania (Viannia) braziliensis and Leishmania (Leishmania) amazonensis parasites, and the infectivity of the amastigote stage for human macrophages. 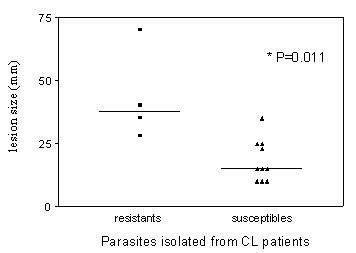 Parasites were isolated from patients with cutaneous, mucosal or disseminated leishmaniasis, and NO• resistance was correlated with clinical presentation. Seventeen isolates of L. (L.) amazonensis or L. (V.) braziliensis promastigotes were killed by up to 8 mM of more of NaNO2 (pH 5.0) and therefore were defined as nitric oxide-susceptible. In contrast, eleven isolates that survived exposure to 16 mM NaNO2 were defined as nitric oxide-resistant. Patients infected with nitric oxide-resistant Leishmania had significantly larger lesions than patients infected with nitric oxide-susceptible isolates. Furthermore, nitric oxide-resistant L. (L.) amazonensis and L. (V.) braziliensis multiplied significantly better in human macrophages than nitric oxide-susceptible isolates. These data suggest that nitric oxide-resistance of Leishmania isolates confers a survival benefit for the parasites inside the macrophage, and possibly exacerbates the clinical course of human leishmaniasis. Leishmaniasis is a parasitic disease caused by the Leishmania spp. protozoa, transmitted to the skin of a mammalian host during the bite of an infected female sand fly vector. Infections range in severity from asymptomatic to disfiguring forms of tegumentary and potentially fatal visceral leishmaniasis [1, 2]. American tegumentary leishmaniasis (ATL) presents a spectrum of clinical manifestations characterized by cutaneous (CL), mucosal (ML), disseminated (DL) and diffuse cutaneous leishmaniasis (DCL). The major Leishmania species that cause ATL in the New World are L. (V.) braziliensis, L. (V.) guyanensis, L. (L.) amazonensis and L. (L.)mexicana. The typical clinical manifestation of American CL is a single ulcerated lesion with elevated borders, frequently located on the inferior limbs . Mucosal leishmaniasis (ML) is a destructive disease that predominantly affects the nasopharyngeal mucosa. The disease is most common in areas of L. (V.) braziliensis transmission and usually occurs months or years after cutaneous leishmaniasis . Disseminated leishmaniasis (DL) has been reported almost exclusively in northern and northeastern Brazil. DL is characterized by the appearance of multiple pleomorphic lesions in two or more noncontiguous areas of the body . Leishmania is a digenetic protozoan with an extracellular flagellated promastigotes form which replicates and matures to the infectious metacyclic form in the gut of the sand fly vector. The promastigotes is transmitted to a mammalian host during the bite of an infected sand fly. Promastigotes undergo facilitated phagocytosis by a macrophage and convert to the obligate intracellular amastigote life stage [6, 7]. Amastigotes survive in macrophage phagolysosomes, a hostile environment for many microbes. Leishmania spp. must undergo profound biochemical and morphological adaptations to survive successfully and multiply within macrophages . The mechanisms through which the parasite resists killing within the toxic environment of the phagolysosome remain incompletely defined. Leishmaniasis is controlled through cell-mediated immune defenses . Murine models have illustrated that macrophages produce IL-12, which induces CD4+ T cells and NK cells to release interferon gamma (IFN-γ), polarizing the immune response toward a type 1 (Th1 type) phenotype [9, 10]. In murine systems, IFN-γ has been shown to synergize with another macrophage derived cytokine, tumor necrosis factor alpha (TNF-α), activating nitric oxide synthase (iNOS or NOS2) to produce nitric oxide (NO•) with resultant in killing of intracellular parasites [11–13]. NO• is generated from the oxidation of the terminal guanidine nitrogen atoms of the L-arginine by NADPH dependent enzyme nitric oxide synthase (NOS) . In murine models of leishmaniasis, NO•-dependent mechanisms have been shown to be critical for control of Leishmania infection[15, 16]. The role of NO• in leishmanicidal activity of human macrophages, has been debated . However, recent data suggest that NO• plays a role in the response of human macrophages to intracellular infections, but the nature of this role is not yet clear [18, 19]. Putative NO•-mediated leishmanicidal actions in eukaryotic cells include inhibition of mitochondrial respiration, inactivation of peroxidases, increasing susceptibility to oxidant damage, inhibition of glycolysis, mutation of DNA, inhibition of DNA repair and synthesis, S-nitrosylation, ADP-ribosylation, tyrosine nitration of proteins, disruption of Fe-S clusters, zinc fingers or heme groups, and peroxidation of membrane lipids [20, 21]. The Leishmania spp. possesses unique antioxidant mechanisms and enzymes. Notably, they convert their abundant GSH stores to trypanothione (TSH) and use TSH reductase/oxidase systems for redox cycling . The protozoa express an iron superoxide dismutase (SOD) but not a manganese SOD, and they have peroxidoxins for handling oxidative stress [23–26]. Nonetheless, oxidant resistance in these parasites are inducible , and one expects these systems are susceptible to inactivation by oxidant species similar to other eukaryotes. Resistance to nitric oxide has been described in E. coli and M. tuberculosis. Resistant isolates have been associated with a more severe outcome of disease than that caused by non-resistant strains . However, natural NO• resistance in Leishmania spp. isolates has not previously been described. In the present study, we evaluated the effect of NO• generated from NaNO2 (pH 5.0) on the viability of L. (V.) braziliensis and L. (L.) amazonensis promastigotes. NO• resistant Leishmania amastigotes multiplied significantly better than nitric oxide-susceptible parasites during infection of human macrophages. Furthermore, NO• resistance was directly associated with lesion size, a clinical measure of disease severity. L. (L.) amazonensis and L. (V.) braziliensis parasites were obtained by needle aspiration of lesions from patients with CL, DL or ML. Parasites for study were randomly selected from frozen nitrogen Leishmania stocks by investigators blinded to the Leishmania species or clinical form of leishmaniasis. Parasites were speciated by isoenzyme electrophoresis and monoclonal antibodies as described. This analysis was performed by Departamento de Bioquimica e Biologia Molecular, Instituto Oswaldo Cruz, FIOCRUZ, Rio de Janeiro, Brazil . Parasite isolates L. (V.) braziliensis (n = 17) and L. (L.) amazonensis (n = 11) were initially cultivated from patient specimens in tubes with biphasic medium (NNN) consisting of rabbit blood agar overlaid with liver infusion tryptose (LIT), supplemented with 10% heat inactivated fetal bovine serum medium (Sigma Chemical Co., St. Louis, MO). Following isolation, parasite isolates were cryopreserved. The time of storage of the selected strains was similar (p > 0.05). The parasites selected for study had not been previously passaged in liquid culture medium before the beginning of the present study. After selection, parasite isolates were expanded in Schneider's insect medium (Sigma) pH 7.2 supplemented with 10% fetal bovine serum (FBS) and 2% male human urine at 25°C (complete Schneider medium). L. (L.) amazonensis (n = 10) and L. (V.) braziliensis (n = 6) promastigotes in log phase growth were adjusted to 2 × 107 parasites/ml in Hanks' balanced solution (HBBS Sigma, pH 5.0). Twenty μl aliquots containing 4 × 105 parasites were placed in 96-well U shaped plates containing 180 μl of 0 to 16 mM NaNO2 (freshly prepared NO• donor) in Hanks Balanced Solution, pH 5.0. After 4 hours incubation at 25°C, plates were centrifuged (700 × g for 10 minutes). The viability of the remaining parasites was assessed by incubation for 20 hr in 200 μl of complete Schneider's medium with 1 μCi of Thymidine (3H-TdR; ICN Immunochemicals, Costa Mesa, CA, USA) to allow them to enter logarithmic growth. Thymidine incorporation was assessed on a β counter. L. (L.) amazonensis (n = 5) and L. (V.) braziliensis promastigotes (n = 14) in log phase growth were adjusted to 5 × 107 parasites/ml in Hanks' balanced solution (HBBS Sigma, pH 5.0). Twenty-μl aliquots were incubated in 180 μl of 0 to 16 mM NaNO2(freshly prepared NO• donor) in Hanks Balanced Solution, pH 5.0 in 96-well U shaped plates. After 4 hrs incubation at 25°C, plates were centrifuged (700 × g for 10 minutes) and parasites were resuspended with 200 μl of complete Schneider medium. After an additional 20 hrs at 25°C and centrifugation, parasite viability was measured by incubation in 0.5 mg/ml of MTT [3-(4,5-dimetthythiazol-2-yl)-2,5-diphenyltetiazolium bromide] in Hanks solution, pH 7.0 at 25°C for 4 hrs, followed by dilution in an equal volume 0.04 N HCl in isopropanol. Living mitochondria convert MTT to dark blue formazan that is soluble in acid-isopropanol and detectable on a microplate reader at 540 nm. The percentage of viability was calculated from the OD ratio of untreated versus NO•-treated parasites × 100 . For each parasite isolate 3 experiments at least were performed to test for NO• susceptibility. The thymidine incorporation and MTT assays were done with 28 Leishmania isolates of both species. Seven isolates were tested with both methods. The virulence of Leishmania spp. is highest in stationary phase, or metacyclic organisms. Nonetheless the MTT and [3H]-TdR uptake assays are most sensitive for log phase organisms. We previously reported that these assays of virulence and oxidant sensitivity in log phase correlate with oxidant sensitivity and virulence in stationary phase organisms [27, 30]. As such, viability assays were performed using log phase promastigotes, whereas studies of interactions with mammalian cells utilized stationary phase organisms. Peripheral blood mononuclear cells (PBMCs) were isolated from the peripheral blood of three different healthy human donors. Briefly, heparinized blood was diluted 1:2 with 0.15 M NaCl and overlaid on Ficoll Hypaque (LSM; Organon Teknika corporation, Durham, NC, USA). After centrifugation, mononuclear cells were collected at the plasma – Ficoll interface, washed three times and resuspended in RPMI 1640 with 10% heat inactivated human AB serum, 100 U penicillin/ml and 100 μg streptomycin/ml (complete medium) (GIBCO BRL, Grand Island, NY). Monocytes were separated from 1 × 106 PBMCs by adherence to 8 well Lab Tek plates for 2 h at 37°C, 5% CO2, non-adherent cells were removed by washing, and complete medium was added. Adherent monocytes differentiated to macrophages over six days incubation at 37°C in 5% CO2. One NO•-resistant and one NO•-susceptible isolate each of L. (V.) braziliensis and L. (L.) amazonensis (total 4 isolates)were selected for the macrophage infection assays. Three to 4 replicate assays were performed for each isolate. Promastigotes were maintained at 25°C in Schneider's insect medium (Sigma) pH 7.2 supplemented with 10% fetal bovine serum (FBS) and 2% human male urine at 25°C (complete Schneider's medium). Promastigotes in stationary- phase of growth were used in all experiments. All experiments were performed in 3 assays for L. (V.) braziliensis and 4 assays for L. (L.) amazonensis using PBMC/macrophages from 3 different healthy volunteers. The same donors were used for the different species so that the results are directly comparable. After Six-day monocyte-derived macrophages were infected with a 10:1 ratio of stationary – phase promastigotes to macrophages for 2 hours at 35°C, 5% CO2. Extracellular parasites were removed by gentle washing and infected macrophages were maintained for up to 96 h. Cells were stained with Giemsa and the infection levels were enumerated microscopically by counting the infected cells and parasites per 100 macrophages by three independent observers, blinded to the experimental conditions. Clinical characteristics of the patients such as age, lesion size, Montenegro skin reaction, duration of disease and clinical manifestation of leishmaniasis were determined from clinical records after characterizing the NO• susceptibility of isolates. Adequate data were available for fourteen patients. Most patients were identified and diagnosed at the Corte de Pedra Health Post, located in an endemic area for cutaneous leishmaniasis situated in the southeast of the state of Bahia, Brazil. The remainder of patients was referred to the University Hospital Prof. Edgard Santos of the Federal University of Bahia, Brazil. This study was approved by the Ethical Committee of the Hospital Universitário Prof. Edgard Santos and an informed consent was obtained from all participants or their parents or guardians if patients were less than 18 years old. Student's t-test was used to compare the age, lesion appearance, and human macrophage infection studies. Lesion size and Montenegro diameter were analyzed by Mann-Whitney nonparametric test. Fischer's Exact test was used to compare NO•-resistant versus NO•-susceptible L. (L.) amazonensis and L. (V.) braziliensis. An alpha of 5% (p ≤ 0.05) was considered for statistical significance (two tailed). Statistical analysis was performed using GraphPad Prism 3.0 (GraphPad software, San Diego, CA, USA). The susceptibility of L. (L) amazonensis (n = 11) and L. (V) braziliensis (n = 17) promastigotes to NO• toxicity was evaluated using two measures of parasite viability: first, the rate of [3H]-thymidine incorporation into parasite DNA, and second, a colorimetric measure of mitochondrial activity according to MTT metabolism to formazan. Our preliminary titrations led us to a definition of NO• susceptibility as measured viability that is less than 5% of control parasites after exposure to 8 mM NaNO2. Using this definition, we found that 73% (8 of 11) of the L. (L.) amazonensis isolates and 18% (3 of 17) L. (V.) braziliensis isolates were resistant to NO• (Table 1). Of the NO•-susceptible isolates, a titration of NaNO2 from 0.25 mM to 16 mM showed concentration-dependent killing of susceptible isolates with nearly 100% killing at 8 mM NaNO2. In contrast, NO•-resistant L. (L.) amazonensis and L. (V.) braziliensis isolates remained viable even in 16 mM NaNO2 (Figure 1, Tables 2, 3, 4 and 5). The storage time in liquid nitrogen of the NO•-susceptible isolates (mean ± SD = 6.6 ± 3.2 years) was similar to the NO• resistant isolates (7.8 ± 2.7 years), p = 0.3. Survival of L. (V.) braziliensis and L.(L.) amazonensis promastigotes in increasing concentrations of NO • measured by Thymidine incorporation (A and B) and colorimetric MTT assay (C and D). Promastigotes in HBSS pH 5.0 were exposed to increasing NaNO2 concentrations (0.25–16 mM) for 4 hours. Viability was measured by incorporation of 3H-TdR or conversion of MTT of formazan as described in the Methods section. Data in panels A and B represent mean ± SEM percentage survival for (1A) 8 resistant L. (L.) amazonensis and two resistant L. (V.) braziliensis isolates, (1B) two susceptible L. (L.) amazonensis and 4 susceptible L. (V.) braziliensis isolates as measured by thymidine incorporation. Data in panels C and D represent the mean ± SEM MTT conversion for (1C) 3 NO•- resistant L. (L.) amazonensis and 2 NO•-resistant L. (V.) braziliensis isolates, or (1D) 2 susceptible L. (L.) amazonensis and 12 susceptible L. (V.) braziliensis isolates. Thymidine incorporation assay of resistant L. (L.) amazonensis and L. (V.) braziliensis promastigotes to NO (NaNO2) donor in vitro. MTT colorimetric assay of resistant L. (L.) amazonensis and L. (V.) braziliensis promastigotes to NO (NaNO2) donor in vitro. 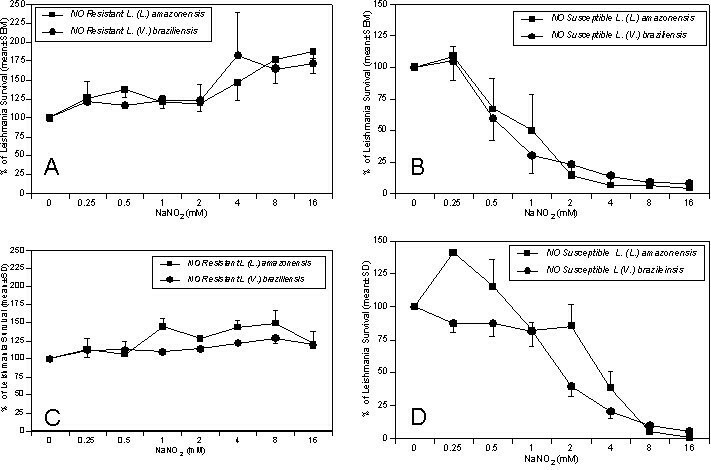 1 × 106 L. (L.) amazonensis and L. (V.) braziliensis promastigotes contained were exposed for 4 hours to increasing concentrations of the NO• donor NaNO2 (0.25–16 mM) in HBSS pH 5.0. The cells were then washed and distributed in parasite growth medium for 20 hours. After this time the supernatants were removed and the parasites were incubated in HBSS, pH 7.0 plus 10 μl of MTT for 4 hours. Viability was a measured by the conversion of MTT to formazan and is expressed as the OD at 540 nm. Data are mean ± SD of NO•- resistant Leishmania isolates (Table 4) or NO• susceptible Leishmania isolates (Table 5). Two isolates each of L. (L.) amazonensis and L. (V.) braziliensis, one NO•-resistant and one NO•-susceptible were evaluated for their ability to infect and proliferate within culture-derived human macrophages in vitro. The data demonstrate that NO•-resistant and NO•-susceptible L (L.) amazonensis and L. (V.) braziliensis infected human macrophages with similar efficacy, as demonstrated by a similar degree of macrophage infection at 2 hours with all isolates (Figure 2, p > 0.05). Beginning 24 h after infection, intracellular macrophage killing of NO•-susceptible parasites of both Leishmania species was evident from the declining parasite numbers. In contrast, NO•-resistant parasites either maintained an unchanged infection level [L. (V.) braziliensis] or multiplied [L. (L.) amazonensis]. Thus, at the 96 hr time point the numbers of intracellular NO•-resistant L. (L.) amazonensis amastigotes was significantly higher than NO•-susceptible parasites (mean ± SD = 534 ± 164 versus 219 ± 75, p = 0.01). Similarly, the numbers of intracellular NO•-resistant L. (V.) braziliensis was significantly higher than NO•-susceptible parasites (mean ± SD = 315 ± 56 versus 87 ± 3, p = 0.002) (Figure 2A and 2B). When the results were calculated as the percent of cells infected, data revealed there were also significantly higher numbers of macrophages infected by NO•-resistant compared to NO•-susceptible L. (L.) amazonensis (mean ± SD = 68 ± 5.2 versus 47 ± 10, p = 0.008), and higher numbers of macrophages infected with NO• – resistant versus susceptible L. (V.) braziliensis (61 ± 4 versus 32 ± 5, p = 0.002). This suggests that parasites spread to new cells in the macrophage monolayer in vitro (Figure 2C and 2D). Although we did not evaluate the mechanisms, these data suggest that NO•-resistant amastigotes survive and multiply in resting human macrophages better than susceptible isolates. Infection of human macrophages with resistant or susceptible L. (V.) braziliensis or L. (L.) amazonensis isolates. Human Mφ from 3 healthy donors were infected with NO•-susceptible or NO•-resistant L. (L.)amazonensis or L. (V.) braziliensis and evaluated at the designated time points for the level of intracellular infection. After monolayers were stained with Giemsa, the level of infection was expressed as number of amastigotes per 100 Mφ (A, B), and as the percentage of infected Mφ (C, D) for L. (L.) amazonensis (A, C) or L. (V.) braziliensis isolates (B, D). The data are expressed as the mean ± SEM from 3 separate experiments for L. (V.) braziliensis and the mean ± SEM from 4 experiments for L. (L.) amazonensis. Parasites were used in stationary phase of growth. Statistical analysis was performed using the paired t-test. Clinical records were available for full analysis for 14 isolates from patients with CL. Evaluation of these records indicated that patients infected with NO•-resistant L. (L.) amazonensis or L. (V.) braziliensis isolates presented with a larger ulcers (mean ± SD diameter = 43.2 ± 18 mm) than patients who had NO•-susceptible parasites (18.0 ± 8 mm, p = 0.01;Figure 3). However, no significant differences between these patient groups were observed in the time from first lesion detection by the patient to the time of clinical evaluation by a physician (mean ± SD = 48 ± 34 days for NO•-sresistant versus 32 ± 25 days for NO•-susceptible isolates, p = 0.3). Although not significant possibly due to small numbers, 50% of patients with ML, a more severe form of disease, had NO•-resistant isolates compared to 31% of the CL patients had NO•-resistant isolates. Both isolates from patients with DL were NO•-susceptible. There was no significant difference between characteristics of the ulcer at initial presentation, patient age, or size of the Montenegro skin reaction to Leishmania antigen between patients harboring NO•-resistant versus NO•-susceptible Leishmania isolates. Association between NO•-susceptibility of the Leishmania isolate and size of the initial cutaneous lesion in CL patients. Patients (n = 14) with cutaneous leishmaniasis were assessed for lesion size at the time of clinical presentation. This is graphed with the correlating 4 NO•-resistant Leishmania ( 3 L (L.) amazonensis and 1 L. (V.) braziliensisor 10 NO•-susceptible Leishmania (2 L (L.) amazonensis and 8 L (V.) brazilienis ), (p = 0.01, Mann-Whitey nonparametric test). In the current study we demonstrated for the first time that some isolates of both L. (V.) braziliensis and L. (L.) amazonensis promastigotes are resistant to killing by nitric oxide. Additionally, we showed that the amastigotes from two resistant isolates survived and multiplied better than susceptible isolates in resting human macrophages in vitro. Macrophages play a pivotal role in Leishmania infection. After phagocytosis, Leishmania promastigotes enter a parasitophorous vacuole within which the macrophage can provide a safe haven for the parasite to transform into amastigotes and proliferate in a naïve host [6, 31]. In an immune host, macrophages can be activated by inflammatory cytokines to produce toxic metabolites that result in intracellular killing of Leishmania , or their microbicidal capacity can be dampened or abrogated by suppressive cytokines, leading to disease symptoms . Specifically, TNF-α and IFN-γ elaborated by macrophages or T cells synergize to up-regulate iNOS and the NADH oxidase, with the resultant production of reactive nitrogen intermediates (RNI) and reactive oxygen intermediates (ROI), respectively, that mediate killing of intracellular Leishmania [32–36]. Macrophages can alternatively produce IL-10 and TGF-β that inhibit leishmanicidal activity. Both of these cytokines enable the parasite to grow locally and disseminate to distant sites [37–39]. Many prior studies focus on the host immune response during leishmaniasis and the ability of host cells/cytokines to influence the outcome of Leishmania infection. During the current study we focused instead on the innate susceptibility of the parasite to leishmanicidal molecules, and their ability to resist to a host microbicidal response. We found that human L. (V.) braziliensis and L. (L.) amazonensis isolates differ in their innate susceptibility to killing by RNI in vitro, falling into two groups based on their resistance to nitric oxide. Susceptible isolates of both Leishmania species were nearly totally killed by 8 mM of acidified NaNO2, whereas NO•-resistant isolates remained viable even in 16 mM NaNO2. These divisions were biologically relevant, in that patients with NO•-resistant cutaneous isolates produced significantly larger cutaneous ulcers than NO•-susceptible Leishmania spp. isolates. Other clinical parameters were not different between NO•-resistant and NO•-susceptible Leishmania, arguing against a spurious association. These clinical data suggest that NO•-resistance may lead to more aggressive forms of clinical disease. Differences in the time of storage in liquid nitrogen or in the length of in vitro promastigote cultivation could not explain our observations, since both NO•-resistant and NO•-susceptible parasites had similar time of storage and were expanded in growth medium only after selection to the present study. Interestingly, a higher proportion of L. (L.) amazonensis isolates than L. (V.) braziliensis isolates were NO•-resistant (73% versus 18%, respectively). A comparable published study showed that promastigotes and amastigotes of L. (L.) enriettii were more sensitive to NO• than L. (L.) major . In conjunction with our data, this suggests that there are inter- and intra-species variations in susceptibility to toxic nitrogen products. Isolate-specific differences in NO• susceptibility are consistent with the observed high degree of DNA polymorphism between isolates of L. (V.) braziliensis from several endemic areas of Brazil, documented in literature reports. Techniques used to discern these polymorphic sequences include multilocus enzyme electrophoresis (MLEE) and internal transcribed spacers (ITS) between the small and large subunits of the rRNA gene and polymorphic DNA amplification (RAPD) [40–42]. Utilizing polymorphic DNA amplification (RAPD) we reported DNA polymorphisms in L. (V.) braziliensis isolates from Corte de Pedra (CP), Bahia, the same location from which the current patient isolates were derived. In addition to finding polymorphism among the L. (V.) braziliensis isolates, we published that certain genotypes are associated with specific forms of leishmaniasis . The current study extends these observations to suggest that there are biological differences between L. (V.) braziliensis and L. (L.) amazonensis isolates that correlate with the clinical course of disease. Murine resistance to Leishmania infections depends at least in part on NO•-mediated intracellular killing of parasites through the action of iNOS [type 2 NO•-synthase (NOS2)]. However, the contribution of iNOS to parasite killing in human macrophages remains debated. Some reports claim a role for nitric oxide in killing of intracellular M. tuberculosis by human alveolar macrophages [18, 43]. Our group and another has published evidence for a role of nitric oxide in macrophage microbicidal activity toward L. (L.) chagasi/infantum [19, 44]. Nonetheless prior studies have reported difficulty in demonstrating NO• production by human macrophages . In addition to NO• derived from the macrophage, the Leishmania spp. themselves are able to produce NO• [45–47]. It is likely that the parasite additionally has innate mechanisms for NO• resistance in order to avoid toxicity from endogenous NO•. As such, the toxic effects of exogenous NO• generated by macrophages or added experimentally would be expected to represent the sum of NO• generated by the parasite plus exogenous NO•, minus the amount of NO• scavenged or inactivated by innate parasite defense mechanisms. We hypothesize that such anti-NO• defenses may be utilized by the parasite for anti-oxidant defense in human infections. This hypothesis is supported by our observation that the degree of NO• resistance correlates with the severity of lesion. We have previously reported that L. chagasi isolates from Brazilians with visceral leishmaniasis are susceptible to killing by NO• . We showed in the current study that Leishmania isolates obtained from of humans with CL differ in their susceptibility to NO•. NO•-resistant Leishmania isolates were found to enter macrophages at a similar rate as susceptible strains, but they resisted intracellular killing by 72 to 96 h after infection. The timing of intracellular killing is consistent with the kinetics of iNOS induction, which acts 48–72 hours after infection . We hypothesize that NO• resistance is one of the mechanisms enhancing parasite survival. Alternatively or additionally, NO•-resistant parasite isolates could inhibit NO• production by macrophages, or other killing mechanisms such as ROI. Importantly, it has been shown that M. bovis inhibits NO•-mediated killing by murine macrophages , as do Cryptococcus neoformans , Trypanosoma cruzi , as well, as L. (L.) amazonensis infection . Other studies have reported that amastigote surface enzymes can inhibit NO• production and thereby reduce leishmanicidal activity [52, 53]. Furthermore, the LPG-associated kinetoplastid membrane protein 11 has been reported to suppress iNOS activity, because it contains monomethylarginine residues, a structural analog of L-arginine, a known inhibitor of iNOS [31, 54]. The meaning of differences in NO• susceptibility amongst different Leishmania spp. isolates is not entirely straightforward. The finding that NO•-resistant Leishmania exhibit improved survival within human macrophages may indicate evasion of iNOS catalyzed toxicity as in murine macrophages and a role for iNOS in control of cutaneous leishmaniasis. Alternatively, since NO• can also play a role in signaling within the infected cell, it is possible that NO• resistant isolates are changing the intracellular signaling, or resistant to alternate microbicidal effector molecules not tested here. It seems likely that NO• resistance may contribute to the apparent increased virulence of these parasites in a human host, based on the differences in severity of the clinical parameters evaluated in the present study (significantly larger lesion size, and trend toward more resistant isolates from ML compared to CL patients). Most certainly, factors other than NO• resistance determine in part the differences in lesion size. Such factors could include the magnitude of parasite inoculum, the host immune response, and the effect of saliva. Nonetheless, it is quite interesting that the NO• resistance correlates with disease severity in our small study. Future studies are needed to better determine the clinical effects of NO• resistance on human infection and response to therapy. We are grateful to Elbe Myrtes Silva and Lúcia Reis for secretarial assistance. This work was supported by Instituto de Investigação em Imunologia (iii), NIH Tropical Medicine Research Center (P50 AI-30639), CNPq and NIH grants AI30639 (EMC, RPA), AI45540, AI48822, AI32135 and TW01369 (MEW), and a Merit Review grant from the Department of Veterans' Affairs (MEW). RPA, ARJ and EMC are funded by CNPq. AG, EMC and RPA participated equally in the study design, and AG and RPA performed all the parasites experiments.